Then you should check out the top five reasons people are moving to Austin! There’s a lot that makes the ATX a super cool place to live! Sure it gets hot during the summer, but Austin is mostly warm year round! January’s average low temperature is 40 and high temperature is 61. That means it’s (almost) always patio weather in Austin! The great thing about moving to Austin is that you can say goodbye to shoveling snow and hello to spending your summer poolside with a cold beverage! Many people’s sole reason for moving to Austin is falling in love with Zilker Park at the ACL Music Festival. 416 acres right in the heart of Austin, it’s home to Barton Springs Pool, disc golf, miles of trails for walking or running and more! 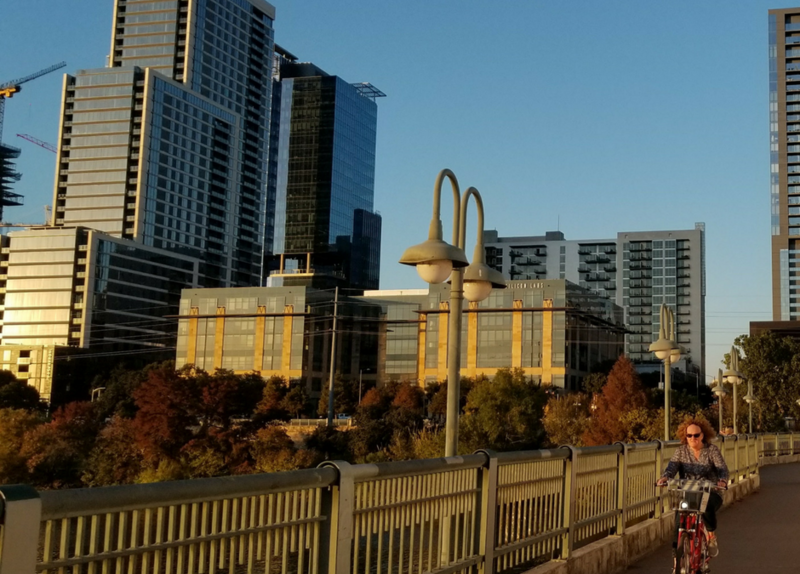 Lady Bird Lake Hike and Bike Trail is 10 miles of path for walking, biking and enjoying the cool breezes off Lady Bird Lake. The Barton Creek Greenbelt has multiple entrances for hiking, swimming, mountain biking, rock climbing, bird watching and more! Austin is becoming more and more known as a foodie town. There’s barbecue worth waiting in line for at Franklin BBQ, La Barbecue, and Micklethwait Craft Meats, sushi worth spending your whole paycheck on at Uchi, and everything in between! Many people have put moving to Austin at the top of their list after falling in love with a breakfast taco. We’re the Live Music Capitol of the World and moving to Austin means you can catch live music every night! There’s live music just about everywhere in Austin, from the airport to the bars along Red River to restaurants! Continental Club, the Mohawk, and Antone’s are just a handful of the long list of venues to get your live music fix in Austin! Big news! EASTside Magazine is looking for a creative intern to join our editorial team this fall. We're searching for someone who wants to have a creative hand in the digital aspects of the magazine, from social media and online content to audience development and events. _ If you have an entrepreneurial spirit, want to learn more about the behind-the-scenes of the publication world, and are passionate about all things local, then send us your resume: info@eastsideatx.com. _ Experience with social media and WordPress is preferred, writing or design skills are a plus! Austin’s economy is booming. The tech scene is thriving, with Facebook, Google, Apple and more all employing tons of Austinites. Austin’s unemployment rate is just 2.9 percent as of March 2018. Plus, Austin’s lower cost of living means that moving to Austin allows your salary to go further. Moving to Austin, the most fun city in Texas, and need a place to live? The apartment locators at Apartment Experts North know everything about Austin and can help you find a new place you’ll love! Give us a call at 512-339-4166.